Four-color process printed on Side 1 of 18pt C1S Semi-Gloss stock. Coated with Gloss Lamination. H3 business card slits on left pocket. 1" metal rings. 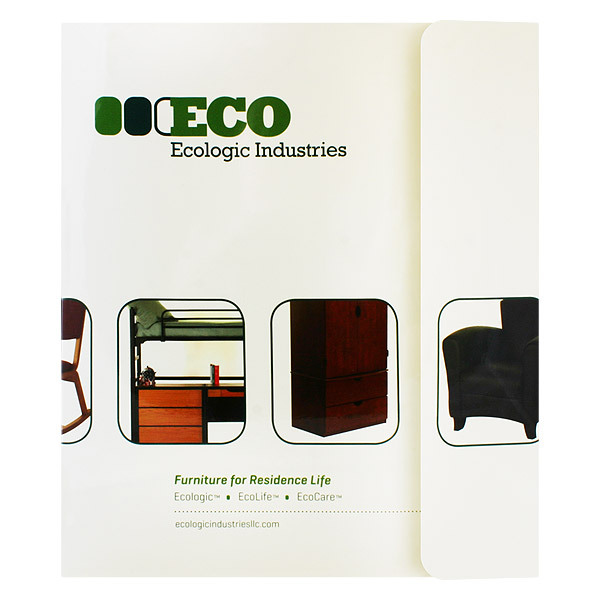 To make the most of this 3D binder, Ecologic Industries turned its exterior into a mini catalogue. Photos wrap around the design, showcasing the brand's eco-friendly dorm and college furniture. Each photo has round corners for a casual look that appeals to modern students, while green text emphasizes the brand's eco-consciousness. Velcro closures secure the flap until users are ready to browse the materials in the 1" metal rings. Four-color process printed on Side 1 of 20pt C1S White Semi-Gloss stock. Coated with Gloss Lamination. H1 business card slits on left pocket. 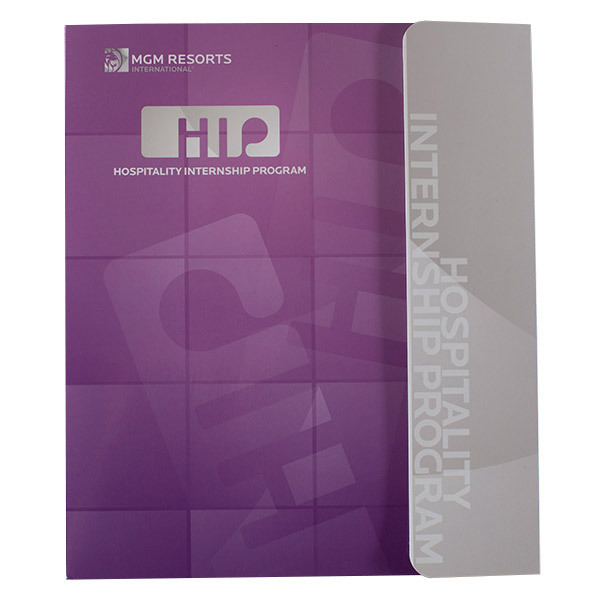 Gray accents subdue the lively purple background on both covers of MGM Resorts International's binder promoting its Hospitality Internship Program, a ten week paid internship to introduce college students to the hospitality industry. Both covers exhibit a grid of interlocking squares with the HIP logo repeated between them. The program's name spelled out vertically along the flap challenges the audience to spend more time reading and engaging with the unusual text. 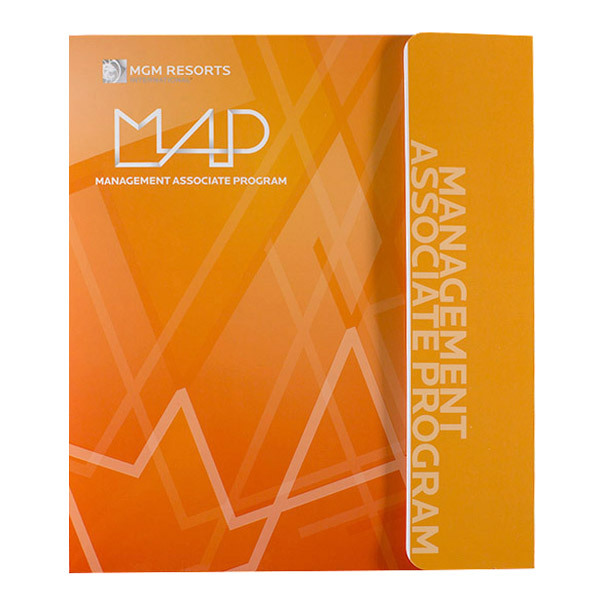 An orange pattern crisscrosses this design for MGM Resorts International's MAP, a 12-month professional development program focused on leadership skills. The fiery color scheme incites enthusiasm, and the "MAP" acronym is hidden in the pattern. The program name spelled out vertically on the flap challenges the reader's mind, while two orange pockets match the flap's appearance. On the back panel, the pattern and MAP name reinforce the program's energetic identity. Four-color process printed on Side 1 of 24pt C1S Semi-Gloss stock. Coated with Aqueous Satin. H3 business card slits on left pocket. 1" metal rings. 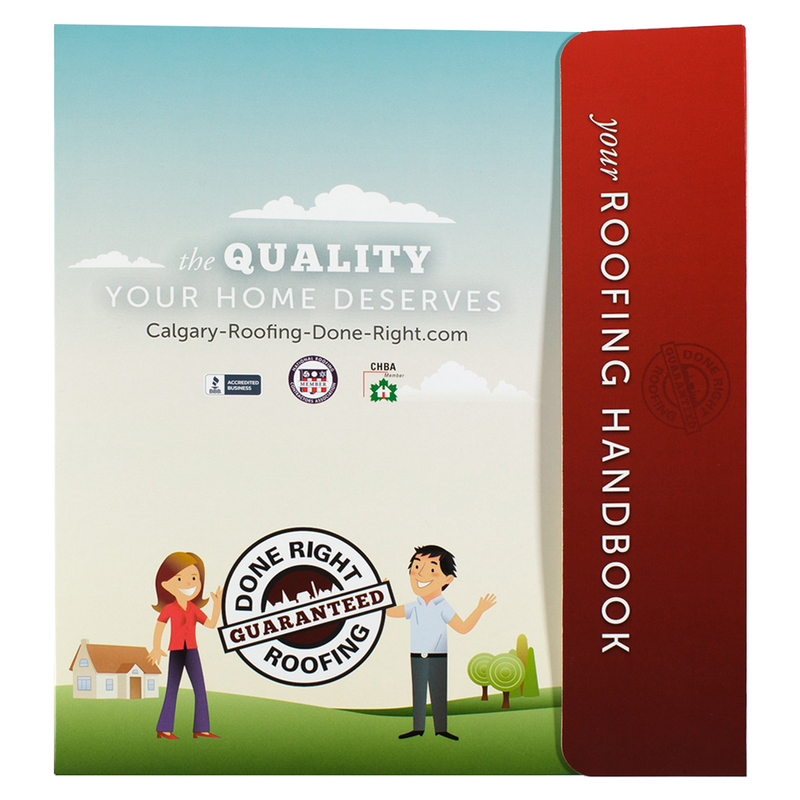 Calgary roofing contractor Done Right Roofing combines images and colors to emphasize its friendliness. Bright illustrations with curved lines and minimal details create a childlike feel to suggest simplicity and ease. Red accents tie in the brand's color scheme. The back panel features information about Done Right's services, from its refusal to use subcontractors to its 15-year warranty. A portfolio-style flap fastens with two Velcro® closures as a double security measure, keeping the covers closed and preventing spilled or lost documents. The binding mechanism makes it a breeze to snap 8 1/2" x 11" documents into place and take them out again. Metal rings come in 1/2", 3/4", or 1" sizes to accommodate various quantities of paper. Two pockets hold additional documents that lack three-hole punches. Both pockets are v-split, so their edges stay clear of the binding mechanism.